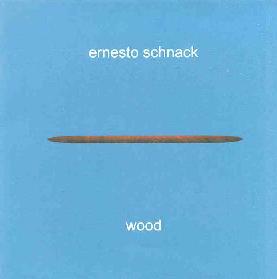 Hailing from Panama, Ernesto Schnack plays solo acoustic guitar, yet you wouldn’t know it from listening to his debut album Wood. Cleverly manipulating sounds, and using samples and loops (all derived from his guitar), Schnack creates music with multiple dimensions, achieving sounds from his instrument that are not likely the sounds you would expect to hear from an acoustic guitar. Drawing on numerous rock styles, as well as Latin American and European folk (I also hear the influence of creative guitarist’s like Leo Kottke, John Fahey, and Michael Hedges working on him), Schnack infuses each composition with it’s own sense of melody and personality so that the result is not just about studio experimenting. Sometimes he uses his studio wizardry to enhance a piece, like the haunting Born in Twilight (Part 1), which hums with moody atmospherics beneath the acoustic melody. Other times, such as on the amazing Envelope, he creates an entire array of sounds, from rippling ambient “electronic textures”, fiery electric soloing, fuzzed out power riffing, and even percussion (he taps and hits his guitar in different places, looping the sample into a percussion track). It’s amazing at times, to even hear metal influences creeping into the wholly acoustic sound, like on the driving fretwork of Commuter. And Coda even has a bit of an electronica feel to it, with layered loops of sound all playing off each other, and a little bit of “Frippery” going on as well! But Schnack displays a reverence for the traditions of his instrument, with about half the songs on the album being more traditional style acoustic songs, like the lovely finger-picked Mountain Song and the lazy, blues inspired O.K., bringing us back to Earth, reminding us that Schnack, before being a studio experimenter, is first and foremost a fine guitarist. Creative, fascinating, and original, Schnack delivers a real treat for fans of adventurous instrumental acoustic music. Rather than smashing the traditions of his instrument, his music is instead, a celebration of acousticity, with an eye always on possibilities rather than limits. For more information you can visit the Ernesto Schnack web site at: http://schnack.does.it. Contact via snail mail c/o Ernesto Schnack; PO Box 5126; Balboa; Ancon; Panama.